Patients diagnosed with pancreatic cancer face a poor prognosis because the tumor forms dense scar-like tissue that is difficult for chemotherapy drugs to penetrate, but a new model may help researchers develop new therapies. 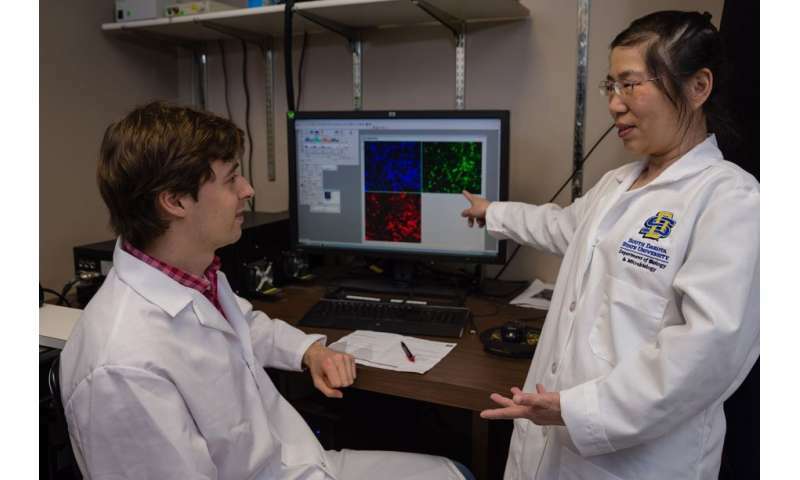 "More than 85 percent of pancreatic tumors form this fibrous tissue," explained Assistant Professor Joshua Reineke of the South Dakota State University Department of Pharmaceutical Sciences. However, most models used to test new drugs and drug delivery methods do not have this feature. Reineke and his research team developed a 3-D pancreatic cancer model in which the tumor surrounds itself with the fibrous tissue, known as a desmoplastic stroma reaction, through funding from the South Dakota Board of Regents. In addition, the researchers compared the new model with tumor tissue donated by patients undergoing surgery for pancreatic cancer through collaboration with Avera Medical Group Oncology and Hematology. "Every patient we met with consented, knowing the research would not help them, but future patients," Reineke said. "These patients have made a critical contribution." The study results are published in Translational Oncology. "This model is a screening tool—it's not the golden ticket, but it can be used to identify things that work or don't work at an earlier stage," said Reineke. Postdoctoral research associate Mikhail Durymanov, whose expertise is in molecular and cellular biology, developed and characterized the models tested, with assistance from postdoctoral research associate Anastasia Permyakova and pharmacy student Christian Kroll. Pancreatic cancer is the fourth-most common cause of cancer-related deaths in the United States with a five-year survival rate of about 8 percent, according to Liz O'Neill, a certified nurse practitioner at Avera Medical Group Oncology and Hematology, who coordinated the study for Avera. According to the South Dakota tumor registry, 117 patients were diagnosed with pancreatic cancer in 2015; this accounts for approximately 3 percent of the total number of cancers diagnosed. Nationally, pancreatic cancer diagnosis accounts for 3.2 percent of the total cancer diagnoses," O'Neill explained. While doing cancer research about five years ago in Michigan, Reineke sought to develop nanoparticles to treat pancreatic cancer. However, he said, "The problem always came back to not having a way to prove the treatments could address the fibrotic issue because there were no good models to test that." That motivated Reineke, whose training included tissue engineering, to shift his work to developing a better model to evaluate potential therapies. "We have not come nearly as far in [pancreatic cancer] research as we have with other cancers," O'Neill said. Reineke agreed: "In the last 40 years, breast cancer went from a similar prognosis to a 95 percent survival rate, while pancreatic cancer has gone from 4 to 8 percent. A lot of what has worked in other cancers has not worked in pancreatic cancer and the unique scar tissue is one of the contributors to this poor prognosis." To evaluate the model, Reineke and his team compared the protein makeup of the scar-like tissue in the model and in the Avera patients' pancreatic tumor tissue. "We can do the exact same assays on our model and the human tumor tissue, comparing the types, amount and structure of the proteins," he explained. "We see that we have a very nice fit—they are very similar." In the experiments conducted, all the spheroid tumors grown developed fibrous tissue. "This is very reproducible," Reineke explained. In addition, the researchers successfully transferred the tumor to a mouse model. "We can also do the animal study with the tumor and know it will have this robust scar tissue." However, he noted, the model does not include an immune component that would account for the body's immune response to the cancer and the treatment. This may be an important limitation to the current model as some of the most significant advancements in cancer therapy have recently come from understanding and enhancing the involvement of a patient's immune system in regulating tumors, Reineke explained. He and his team will work with Avera scientists to address some of the model's limitations, including possibly using patient tissues, rather than cell culture lines. "Interactions with Avera clinicians and pathologists are very helpful in enabling this translational work," he said. "I appreciate Avera Health Systems' willingness to invest in basic research." O'Neill said, "We know the surrounding stroma contributes to reduced penetration of drugs into the tumor itself, so being able to mimic that in preclinical models is super important." Reineke and his team are using the model to test therapies developed at SDSU and by other research groups across the nation and the world to find more effective ways to treat pancreatic cancer.